If I could have only one pistol this would be it. Back about a decade or so ago a battle raged about which was the ultimate pistolcartridge, the .357 Magnum, .45, 9mm, or some of the new .40 and 10mm cartridges. After a couple years of shootout articles, finally many an expert and study clamed the .357 as the arguable victor. Of course the next obvious battery of magazine tests were which 357 reigned king. Every magazine did a .357 magnum shootout and the GP100always came out near the top. Of course the venerable Colt Python captured nearly every shootout's average accuracy, but the Ruger usually held the best groups shot and overall accuracy came down to about 1/8" difference. Being a self professed magazine test junkie, I loved the shootouts, tests and reviews and my heart was set on the simple brute durability of the GP100 and utility of a 4" barrel...and then there was I didn't have extra $300 for the Colt. At that time I only owned only one gun a quality 9mm, which sadly shot the worst groups ever to come out of a gun I held. I wanted accuracy and something that I could hunt with and the RugerGP100 with 4" barrel fit the bill perfectly. To say I have been pleased with my purchase is an understatement. My feeling of how great myGP100 is started me on a long list of other Ruger firearm purchases. 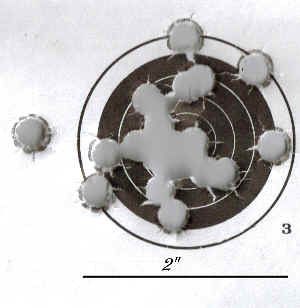 To the right is a 2" 18-shot group at 15 yards off-hand with cheap .38 Special loads. Though I have heard of people getting this accuracy out of Glocks and other autos, I have never witnessed it at the range. In defense of your average .357 GP100 the guy to the left of me while shooting this group was punching approximately the same groups with his GP100 6" barrel. The GP100 is just a good solid accurate gun. Sadly Ruger discontinued the jewelry quality stainless mirror polished version I own due to complaints the the glare off the gun affected high noon shooting sessions and spooked game. They now only offer brushed finish versions in stainless. [Insert eye roll] Perhaps for the extraordinary picky Competition guys maybe, but they customize everything anyway, so I don't think 5 minutes rubbing a scotch-brite pad on the top of the receiver would kill them. My stunningly polished GP100 has never "spooked game", but I could see in some odd tactical situations there might be some advantages. 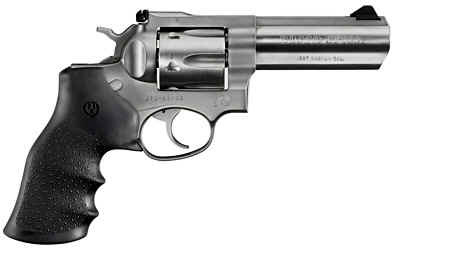 Common sense here is that the GP100 really is too heavy as a "carry gun" with the exception of hunting. It was built rugged and beefy to handle the hottest loads and therefore isn't particularly light. Who in their right mind is packing a 40oz+ gun around in tactical situations or as a carry gun? If you did need to present it in a defensive situation, I really don't think the bullets care whether they are coming out of a polished or brushed finish gun at short range. Whatever the case I think it was a mistake to dump the mirror polished version as an option. Sure, there are always things you don't like about a gun and for me the stock grip had to go. As far as grips go it's probably one of the best looking rubber based grips out there and does a dandy job of absorbing recoil. The problem is that I have a smaller hand and I switched to the Hogue grips to give me something better to hold onto. The Hogue Grip greatly improved accuracy, improved positive grip, and due to better ergonomics also reduced felt recoil. Nearly every Ruger GP100 owner has installed the Hogue grip to the point that Ruger now offers the grip standard on the newly offered gun. The sights are great out of the box and since sighting in originally have never moved on me in all these years. I have intended for quite a while to add night sights, but I jsut can't bring myself to spending more on sights that I would for a complete new gun. In my mind a .22 is the place to start with your first gun, but if you are looking for a great first big bore gun I simply can't recommend the Ruger GP100 enough. In the 4" version, it's a great all around gun that fits everything from target shooting, hunting, to home defense... just like the guys in the article said.